We might have spent half our time in Tokyo a little bit freaked out and even more confused by the food but we were never bored! There are so many amazing new meals to choose from and explore whether that is fresh Sushi, crispy Tempura, simple rice balls or freaky combustion dried cuttlefish! Japan is the epitome of being out of our western comfort zones when it comes to food…and we are adventurous! Tokyo is home to thousands of amazing Shinto shrines and Buddhist temples, from the city centre retreats to the mountain top religious sites. Each and every temple is distinctive and unique, some covered in ornate detail and painted on every surface with bright colours whilst others are simple and understated plain wood and muted tones. Each temple also has a different dedication, be it Japan’s war dead or a particular past leader. These serine spots are the perfect place to relax and reflect. Japan might be known for its sprawling metropolises and huge buildings but it also boasts some of the most beautiful and unique nature in the whole world. From the snowy peak of Mt. Fuji to the urban parks of Tokyo this country has something for everyone whether you want a full on adventure or just a break from the concrete jungle. There are also so many parks and green spaces in Tokyo alone and most are free or very cheap to visit, just one of the ways you visiting Japan is cheaper than you might think! Japan also has some fascinating traditions dating back thousands of years, this modernised society still takes its history very seriously and you are just as likely to see a geisha floating around the narrow wooden streets as you are an array of dazzling billboards. From tea ceremonies to traditional shinto weddings, ryokans and Daruma dolls Japan has held on to its amazing history as it has grown into the modern era. The humble vending machine we all know and often over look is much more than a drinks dispenser over in Japan! These things are an absolute passion to the Japanese and hold pretty much anything you could ever think of! Standing on just about every street corner the vending machine is typically Japanese…it takes up very little room and yet offers so much! Forget just getting a can of coke and a chocolate bar in Japan you can get: Pizzas, ice creams, Clothing, Noodles, guitar strings, drum sticks, bike parts, cupcakes, burgers, eggs, lego, rice, buddhist charms, toy cars, floral arrangements, frozen foods served hot, beer and cigarettes…ok, I think you get the point – If there is something you want, no matter how obscure, there’s a vending machine for that! Of course! Japan is also famous for its gaming and instead of sitting at home on the playstation or xbox you can visit one of the many arcades for a hypnotising experience. These, often multi storey, buildings are maze like full on sensory overload, once you go inside here you could be trapped for days…especially seeing as many of them are open 24hrs a day! lights flashing, games beeping and music blaring these arcades provide any and every time of game going from old classics to exclusive launches…or you know, just some karaoke if you fancy it! Japan is at the forefront of technological advances and if, like us, you are a sucker for the latest gadgets and tech then this is the place to be. Forget waiting for that new games console, phone, camera or other crazy and life changing gadget to make its way over to your country…its here for you to play around with! Not only can you buy the latest technology but it also surrounds you, from unique toilet experiences to bullet trains and robot restaurants, Japan has a whole host of wacky and entertaining inventions! Japan also has its fair share of tall buildings too and they offer amazing views over the metropolis below. Whether that be watching the sunset from the iconic Tokyo Tower, catching a glimpse of Mt. Fuji in the distance from the worlds second highest building, the Tokyo Skytree or standing on top of that famous volcano itself and taking in the impressive vista. Japan has some of the worlds most impressive vantage point from which to look out from and take stock of this beautiful country. Better still you can stay in some of the many amazing hotels over looking the city and wake up to breathtaking vistas of these wonderful views. Check out the best places to stay in Tokyo for those epic morning views. Japan is crazy! 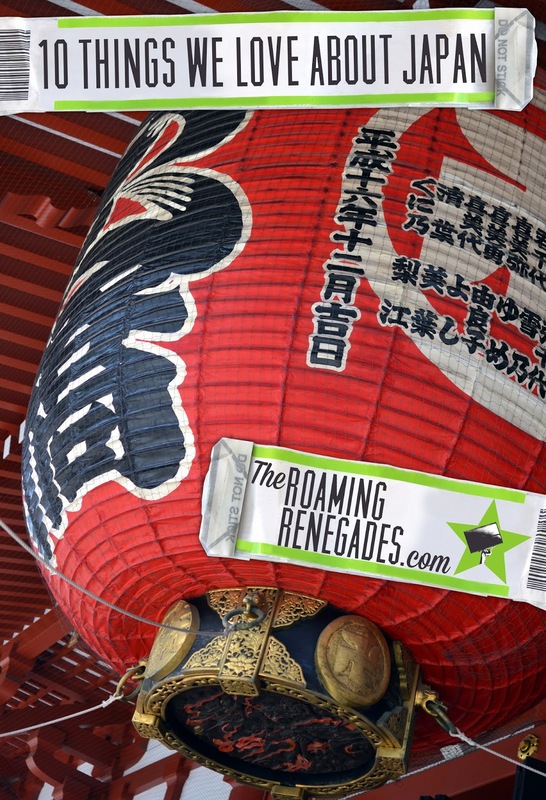 Theres no getting away from it, the capital city of Tokyo is the unrivalled centre of that chaos and we love it! You might have to be a certain type of person to thrive in the overwhelming, crowded, loud and intense hustle and bustle of Tokyo but part of the enjoyment is allowing yourself to get carried away with it instead of fighting it. Have your lost in translation moment on Shibuya crossing, be dazzled by the lights and sounds of Akihabara and get lost on purpose! Just as Japan dishes out craziness and insanity it also carefully hands you peace and serenity. Japan is like a finely balanced sculpture, a schizophrenic life form all of its own. The reason it works so well is that for every moment of chaos is a moment of reflection, for every piece of new technology there is a prized tradition and for every collection of skyscrapers there is a forrest of untamed wildlife. Have you been to Japan? What did you love about it? Cheers Alice! Yeah it’s such a cool place, we want to return so bad!! I love how weird and wacky it all is…and those vending machines are the best! They have machines for everything, crazy!